A 5-4-1 record does not seem like much...until you know the story behind it. 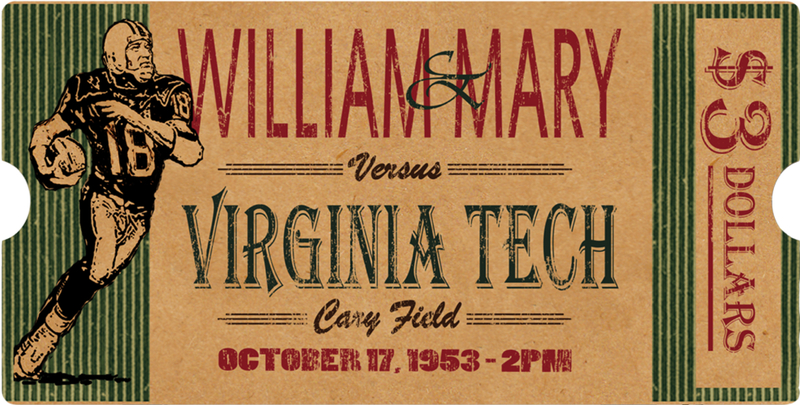 With a squad of just 24 men, the 1953 football Indians were a team held together with tape, Ace bandages, and a love for William & Mary and each other. This is their story of lost teeth, players knocked unconscious, team pride and moral victories. The following story originally appeared in the Fall 2013 W&M Alumni Magazine - Ed. 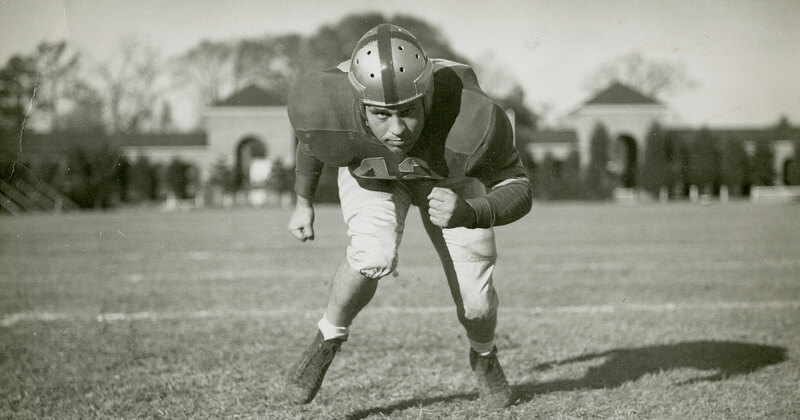 In 1952 Jack Freeman ’44 and his wife, Jane, spent their entire life savings to move from Pennsylvania to Williamsburg so Freeman could be the new head football coach at William & Mary. It was a job few people wanted. In the summer of 1951, the athletic director, football and basketball coaches, and the school president had resigned. 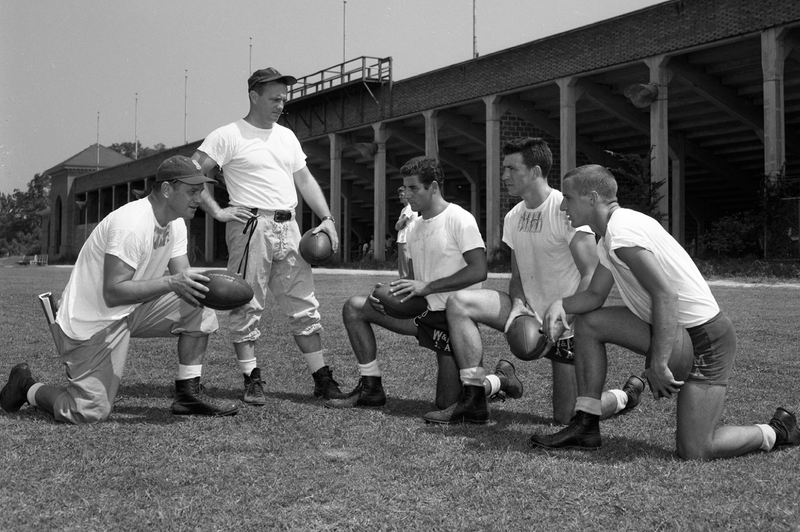 Building Chemistry: (l to r) Backfield Coach Eric Tipton ’37 and Head Coach Jackie Freeman ’44 talk with Al Grieco ’56, Charlie Sumner ’55 and Bob Elzey ’55 about the quarterback position. What they had was 14 returning lettermen and a total squad of 24, including John Risjord ’55, a track athlete who had never played football. And there were new NCAA rules that would work to William & Mary’s advantage. College football returned to the one-platoon rule, with athletes playing on both offense and defense. This off-set the lack of depth on the Indians’ team. With a smaller group, coaches were able to spend more time with athletes individually and players were able to adapt quickly to playing offense and defense. Freeman and his coaching staff shied away from hard contact practices, fearing injuries. “Hard contact was saved for the weekend,” said Marfizo. Practices were focused on conditioning each player to play 60 minutes of full-speed football. Going into the Navy game, the Indians were a two-touchdown underdog, facing a team that was ranked No. 1 in the East. Navy football greeted the visiting team with a, “Who’s he?” as each opposing player was introduced. After the game, the Middies were sure to remember at least one Indian player. Marfizo was dubbed Mr. Versatility by many Southern sports writers after playing seven different positions. “First it was guard, then center, then linebacker and so on,” said Marfizo. “I remember Coach Freeman walking up and down the line and he kept saying, ‘Bill, can you do this?’” Marfizo also made a brave blocking attempt of Navy’s final punt that earned him a collision with a Navy player’s cleats and several lost teeth. The Cincinnati Bearcats handed the team a loss that was the worst for an Indian 11 in 30 years, with a final score of 57-7, but an open weekend before the Virginia Tech game allowed the Indians the chance to recover and the “Upset Express” won their next three games. 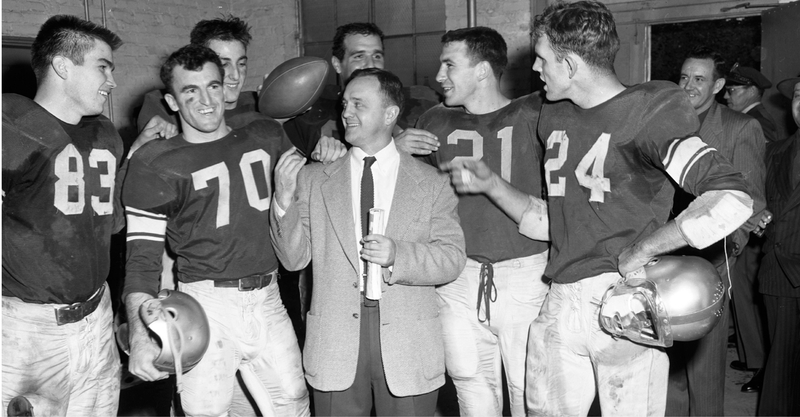 The fighting two dozen: W&M Coach Jack Freeman ’44 is shown flanked by Chet Waksmunski ’56 and Billy Martin ’55 (left) and Charlie Sumner ’55 and Bill Bowman ’54 (right). “I think it was the underdog thing that kept us motivated,” said Marfizo. “It was a team spirit that I’ve never seen before. In the first seven games, 13 men played the entire 60 minutes without replacement. Three players did it three times apiece. In the game against Virginia Tech, Marfizo played a full three and a half quarters before being carried off the field unconscious from a blow to the neck. But toward the end of the season the fighting two dozen began to show signs of hard-fought battles. Injuries took their toll and with no reserves, the Iron Indians began to buckle, losing three of their last four games. A VMI touchdown in the last 58 seconds gave the Indians their second loss of the season. The upset wrecked the Tribe’s bid for the Big Six crown, the Southern Coference Championship and a possible bowl bid. The Indians clobbered Richmond 21-0, but the following week the Generals from Washington and Lee turned the game into a rout in the span of eight minutes in the third quarter. Boston University, with a hard-charging line, explosive backfield and the most depth the Indians had seen all year, handed the Iron Indians their final loss of the season. The Indians finished the year 5-4-1. Four players made the All-Big Six Team, the most from any one team. Jack Freeman was named coach of the year in Virginia. After the season the William & Mary community came out to honor the team at a special ceremony at Phi Beta Kappa Hall.